The game can be traced back to the 1920’s in the USA. Historically it was associated with “money” and betting. However the major tournaments for 9 ball pool have helped to ensure that this game is now one for all the family. It is typically played at a fast pace and trick shots are very common. There are 9 balls each numbered 1 to 9, plus a cue ball. One of the balls is the “9” ball and the object is to pocket this ball. remembering that the “9” ball can be pocketed at any time to win the game. When you pocket a ball you get another shot and so on until either the table is cleared or the 9 ball is potted. 9 ball is played with 9 object balls numbered 1 through 9 and a cue ball. If a player pockets any ball on a legal shot, he remains at the table for another shot, and continues until missing, committing a foul, or winning the game by pocketing the 9 ball. Players are not required to call any shot. A match ends when one of the players has won the required number of games. 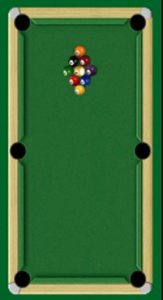 Ideally, if the balls were suitably spread out, a player would strike the cue ball and hit the 1 ball first and the 1 ball would go into a pocket. Then they would strike the cue ball and hit the 2 ball next with the 2 ball going into a pocket and so on right through to finally the 9 ball. Sometimes the balls are not spread out very well - e.g. the 5 ball is sitting right over a pocket and blocking the path of the 1 ball (or lowest ball on the table at that time). As long as a player strikes the cue ball and hits the 1 ball (or lowest numbered ball on the table) first, and if that 1 ball (or lowest numbered ball) or indeed the cue ball then hits the 5 ball and it goes into the pocket, then it's a legal shot. Effectively, any ball on the table may be knocked into a pocket as long as a player strikes the cue ball and hits the lowest numbered ball first.